I kid you not, I had a note in my diary that I kept on bumping until later to document everything I ate in a week for pretty much all of 2018. 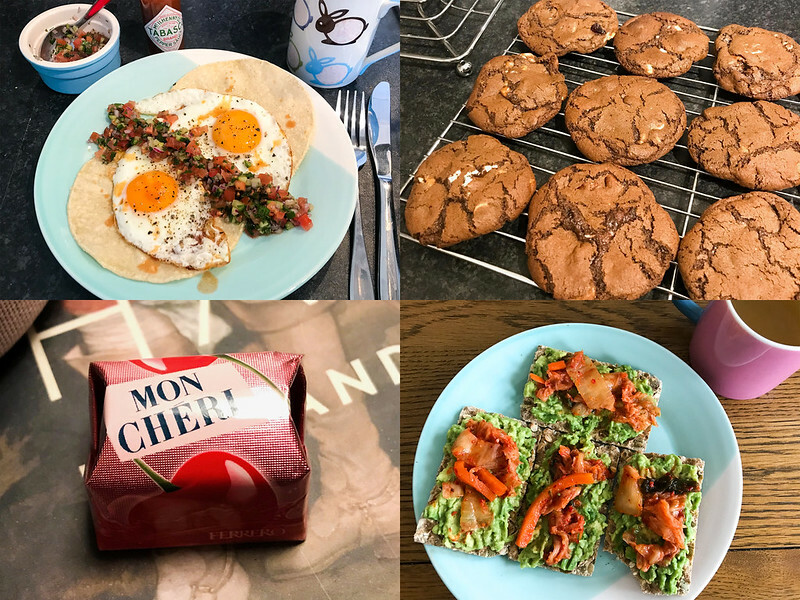 I get so many questions about what it is like to be a food writer, constantly needing to come up with new recipes I thought it would be a fun way to show you all what my (edible) day to day is like. Finally it was Lindsay introducing ‘What I Ate Wednesdays‘ on her blog that finally kicked me into gear to do my long planned food diary. Now, not all weeks are the same, but they fall roughly into three categories; weeks where I’m just at home working on upcoming recipes, producing recipes for blog shoots and for freelance work, and trying out other dishes I’ve bookmarked in the home they’ll give me some ideas and inspiration for something new. 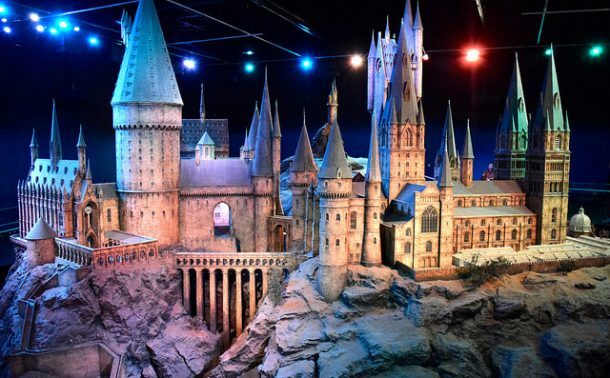 Then there are the weeks where I’m out and about all the time, attending events and reviewing new restaurants, and there are the weeks that are a mix of both. 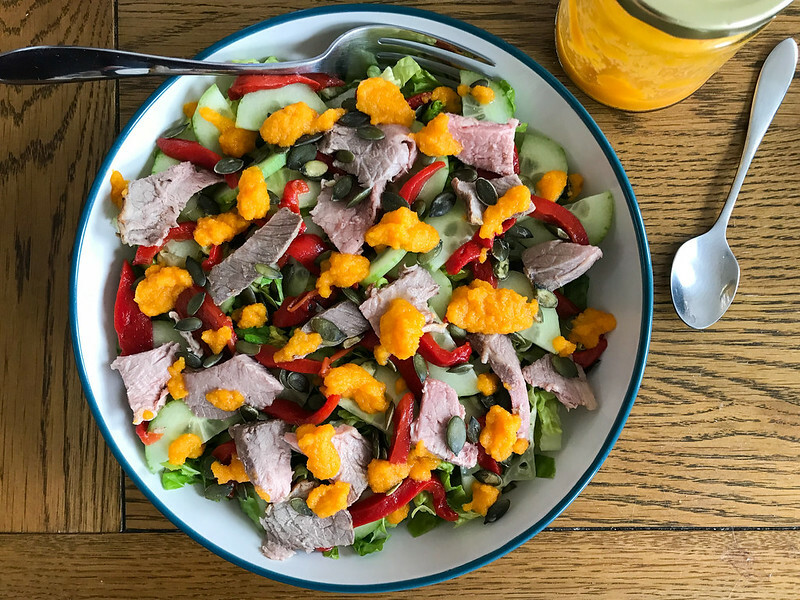 Below is everything I ate in one of those at home testing weeks – I’ll shoot another to share more of an out and about week too if you like – just let me know in the comments! 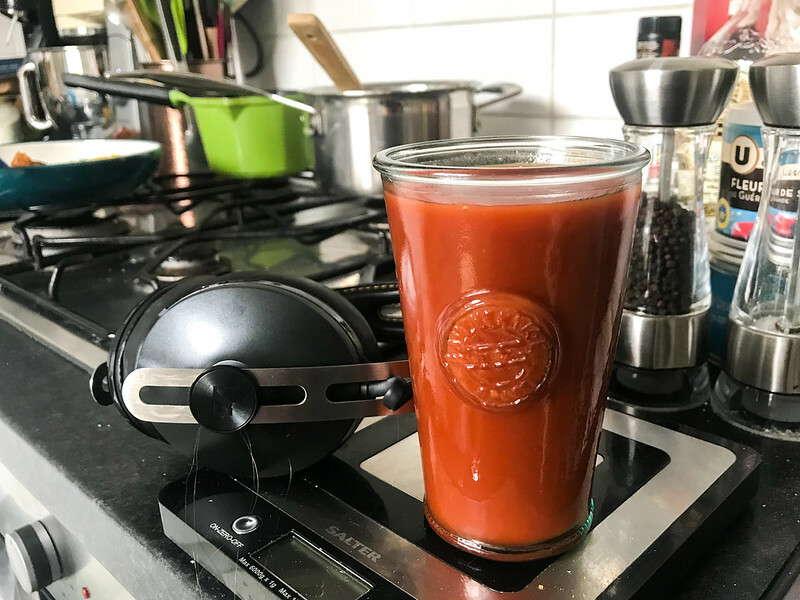 10:09am – Got up a bit late (had stayed up too long the night before binging You on Netflix) so I skipped a proper breakfast in favour of a glass of V8 vegetable juice. I don’t usually eat breakfast every day, it all depends on how early I get up and if I wake up hungry. 3:47pm – I was in the middle of clearing out my kitchen cupboards – first week back at work in the New Year and all that – so I made Kitchen Sink Cookies for dessert later to use up the odds and ends of some packets of things; these were white chocolate chip cookies with some chopped pecans, blanched almonds, dried cranberries and fudge pieces thrown in. 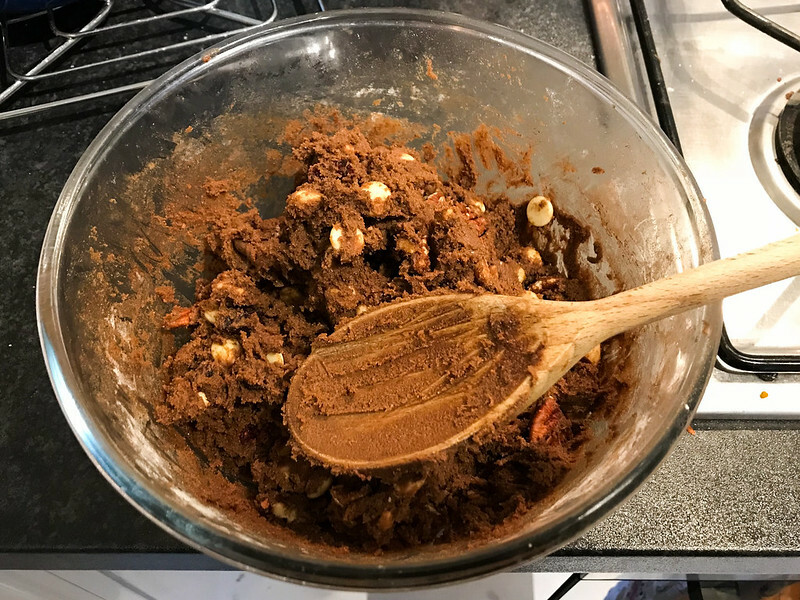 I ate all of the cookie dough I could scrape out of the bowl with my wooden spoon while I was baking, washed down with a mug of peppermint tea. 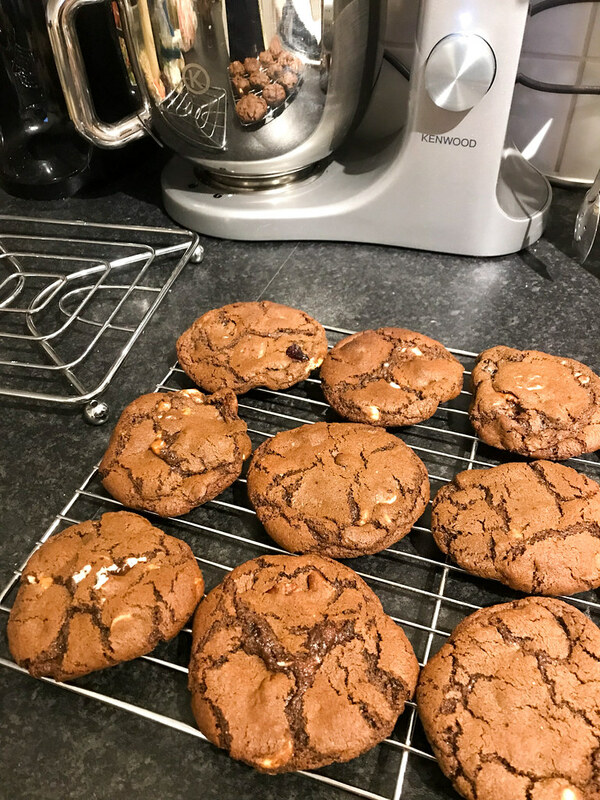 5:06pm – I could not stop thinking about the cookies in the kitchen so grabbed one! 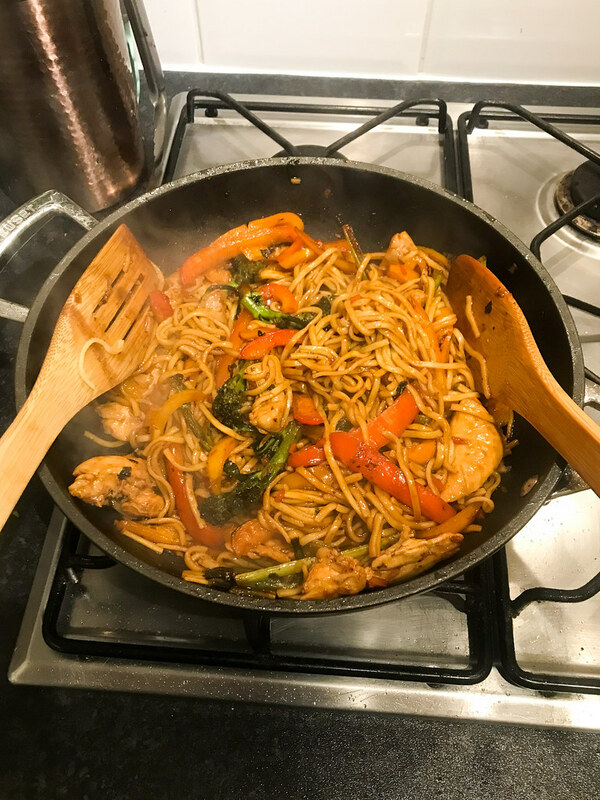 7:17pm – I took a pair of skinless, boneless chicken thighs out of the freezer, and had some mixed peppers and tenderstem broccoli in the fridge that I used to make a riff on this Weeknight 20 Minute Spicy Udon Noodles with egg noodles for dinner – so delicious, that I’ve published the recipe for how I changed it and adapted it to British ingredients here. 8:04pm – Finishing off You, had another cookie with another mug of mint tea for dessert. 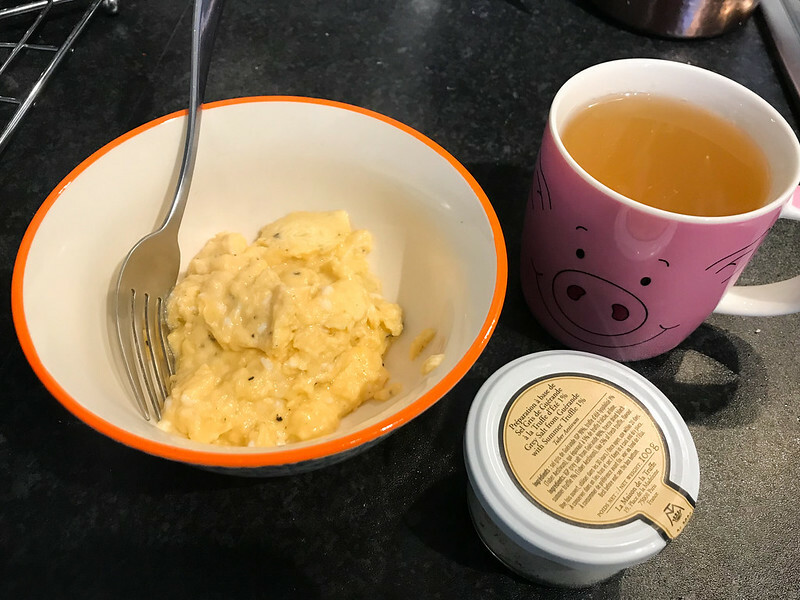 8:27am – A really creamy three egg scramble made with coconut oil instead of butter (a trick I stole off one of the Hemsley sisters a few years ago – can’t remember which – a fantastic swap if you’re avoiding dairy, or if like me you prefer the lighter taste! 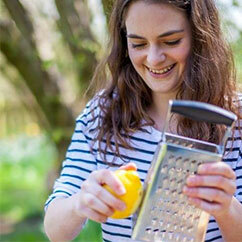 ), black pepper and a generous sprinkling of truffle salt. I usually just do two eggs, but the extra one was in lieu of toast, because there isn’t any. Doing the food shop later on this morning. Washed down with a mug of green tea instead of a glass of V8. 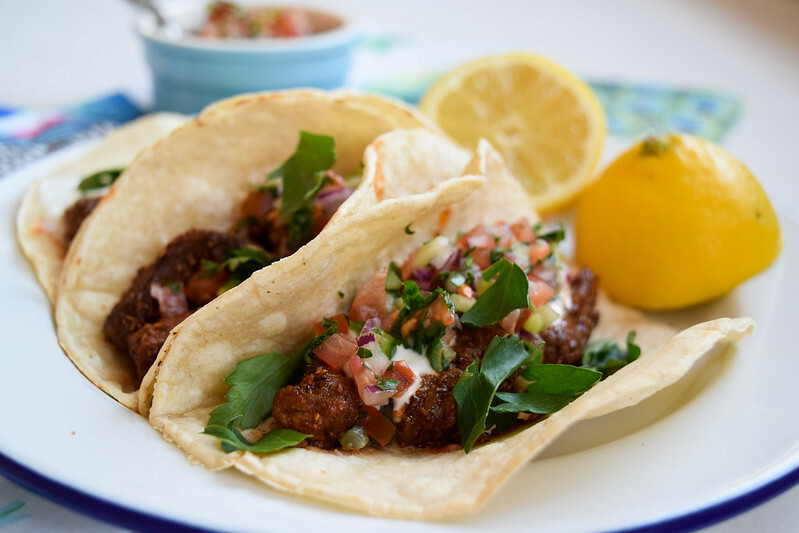 11:20am – Prepping to shoot a taco recipe at lunchtime. Cut a bit too much cucumber for the salsa so snacked on a hunk. Also ate several spoonfuls of salsa balancing the seasoning. 1:14:pm – Three barely warm, but still very tasty steak tacos leftover from a recipe shoot. It’s an unfortunate fact of my job that foods that need to be eaten instantly as they cool quickly – like tacos – will always be eaten cold on photo days. I was not happy with any of the photos I took for days after I posted my California Fresh Crab & Avocado Summer Rolls so the recipe won’t be up in the next few days, but look out for the re-shoot! 5:17pm – On days like this where it is really windy on the river path by the Thames my afternoon power walk takes it out of me a bit more than usual. I’d still got some emails to make it through before making dinner, so time for one of those Kitchen Sink Cookies. 7:55pm – Dinner is a bit late as J stayed late at work. I tried these Buttermilk Crusted Almond Fingers (served with a smidge of barbecue sauce) which were lovely and tender, but did not really get very crispy in my oven, and this kimchee radish salad, which was tasty, but nothing to write home about. 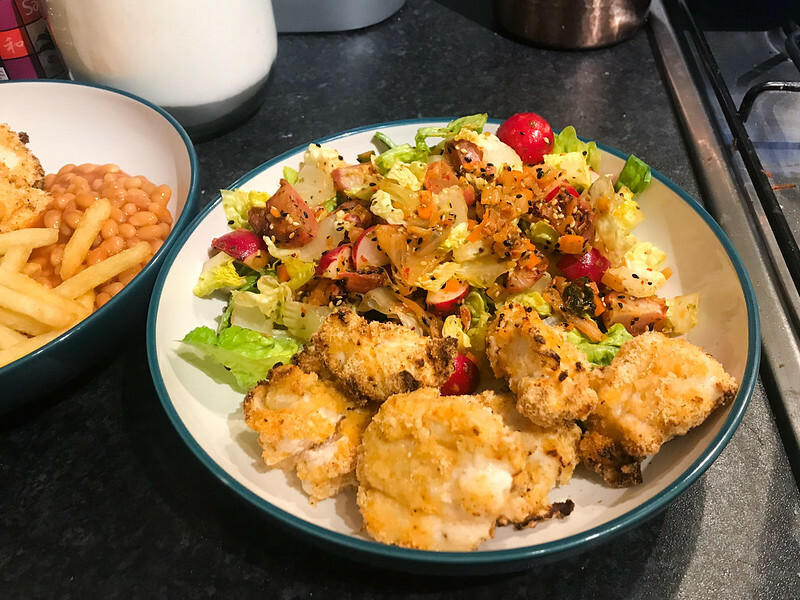 I made J beans and chips in the air fryer instead of the salad, and I stole about 9 of them from checking to see if they were done or not (I find that I only need to run the full chip cycle if the fryer is full with chips for us both) to carrying his dinner to the table. 8:36pm – Another cookie for dessert with another mug of mint tea. 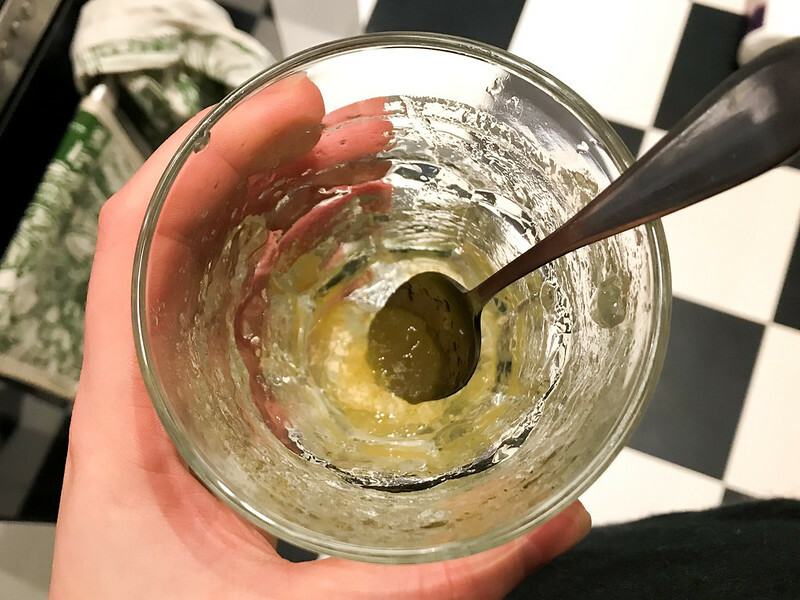 9:31am – Another glass of V8 juice while I figure out breakfast. While on some days I don’t eat breakfast and on others I get up and make myself something raring to go (usually as I’ve got to get out of the house in the morning to go to a meeting, event, or to buy ingredients) there are others, like today, where I’m awake and ready to go way before 9, but I’m not hungry yet, so I grab my laptop and catch up with emails that came in overnight and my blog feed still in my duvet cocoon. 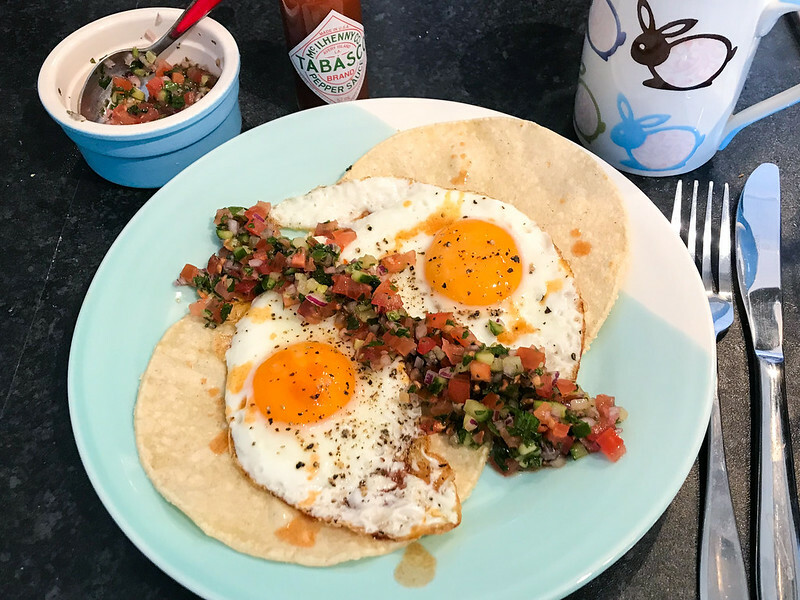 10:03am – A fridge forage that resulted in a slightly strange but totally delicious hybrid between Mexican divorced eggs and a Turkish breakfast: two lightly toasted corn tortillas topped with two crispy fried eggs, some leftover Israeli salad salsa and a more that generous amount of Tabasco. Also a mug of green tea. 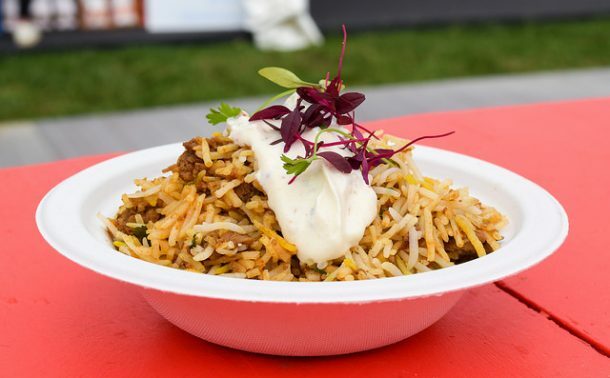 1:10pm – Kimchee Fried Rice is my ultimate comfort food so I wanted to see if I could lighten it. 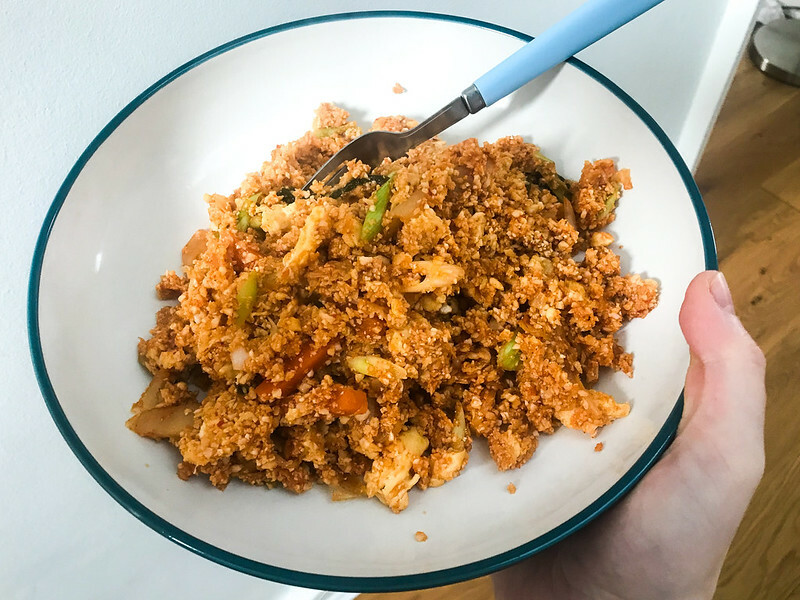 Kimchee Fried Cauliflower Rice was a roaring success so I shot it for this blog post. In other news, how radically different do non-styled iPhone snaps and styles food photos look?? 3:23pm – Doing my taxes. Another cookie required. 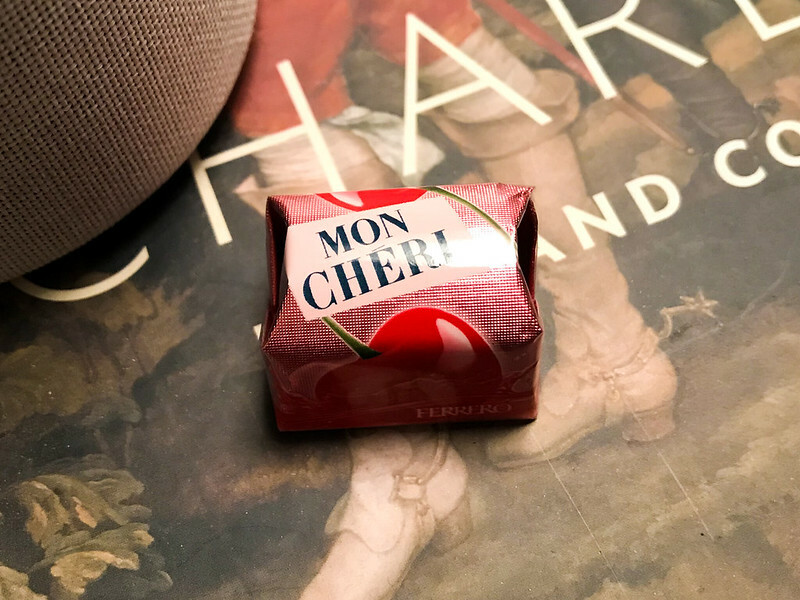 5:06pm – Craving something sweet again so treated myself to a Mon Cherie from my Christmas chocolate stash. 7:32pm – While I was away J picked up some thin cut pork steaks on special offer and frozen them in one whole lump. 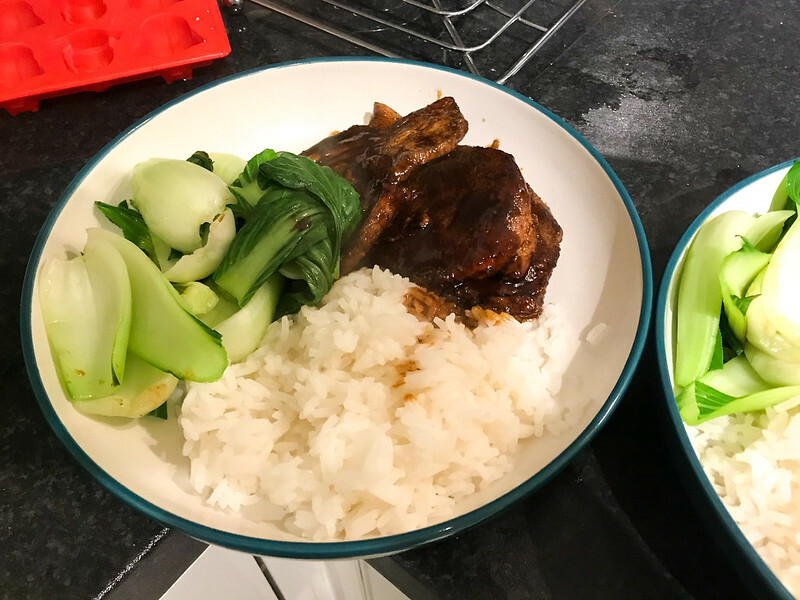 I was not quite sure what to do with them, but I ended up cooking them whole in plaice of the pork fillet slices in my 15 Minute Five Spice Pork with Pak Choi & Jasmine Rice. It worked really well, though I managed two slices where he managed four! 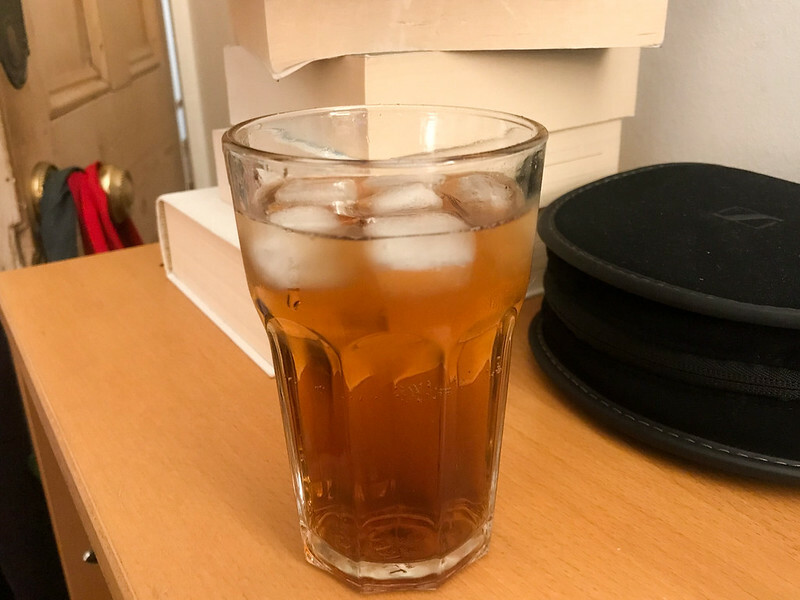 8:09pm – I’d tried to make the Seville Orange Jellies from Strudel, Noodles and Dumplings for dinner on Tuesday, but it refused to set so I did it again upping the gelatine quota. I had mine as today it was actually set enough to spoon, but I still think I may have to add more gelatine to the recipe. J had cookies instead as he things leaving his jelly overnight may help it set a bit more. 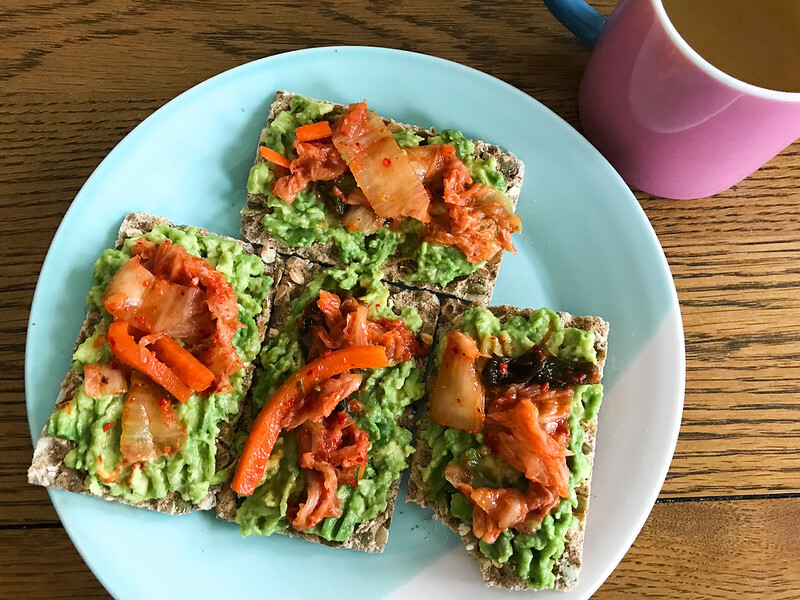 9:29am – Kimchee and smashed, salted avocado on pumpkin seed Ryvita and a mug of green tea. I’d originally planned of having something a bit lighter for breakfast but a run in with the cat that left me bleeding from four deep scratches left me wanting something a bit more substantial! 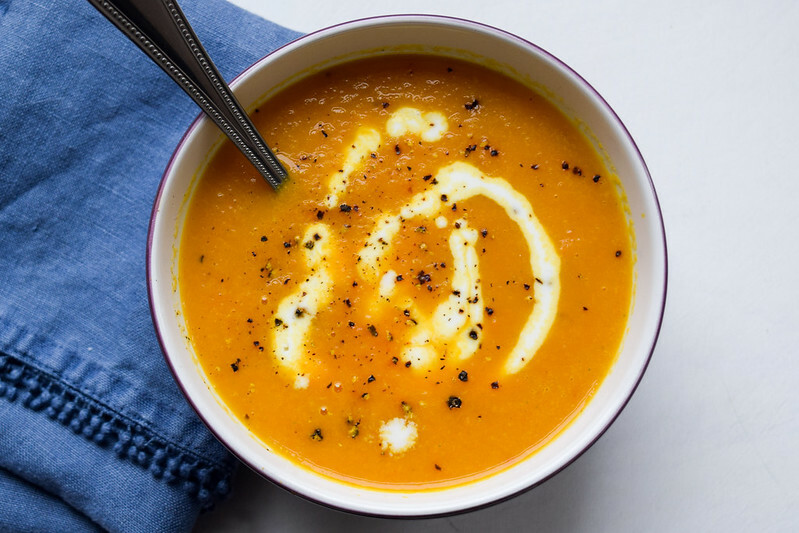 1:27pm – Writing a recipe for a 20-minutes-or-less Carrot & Ginger Soup for Refinery 29 (you can find the recipe here) and ate the bowlful in the photo as soon as I’d finished shooting. I swirled buttermilk leftover from making the chicken nuggets we had for dinner on Tuesday into the soup for the picture as I did not have any open cream or coconut milk in the fridge, and the results were delicious. 2:49pm – Feeling munchy. Had another Mon Cheri. 3:31pm – And another two. 5:00pm – And another cookie. One thing I have learnt doing this challenge to write down everything I eat in the week is that I usually need some sort of snack around the 5pm mark, so I’m going to look into healthier recipes I can keep at hand for my late afternoon munchies rather than resorting to cookies (even if they are homemade) or chocolate. 6:42pm – No, this is not a glass of coke (I can’t stand the stuff) but a shrub made from strawberry balsamic vinegar topped up with San Pellagrino. 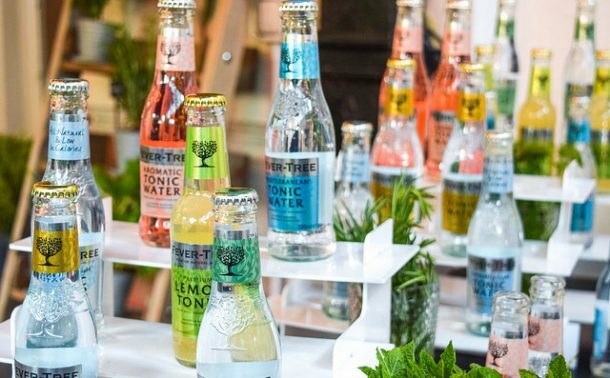 I really fancied something that was not tea or water before I make dinner, I don’t keep fizzy drinks in the house and I’m trying not to drink alcohol on Monday, Tuesday, Wednesday or Thursday nights unless it is a celebration or I’m out with friends. It is not as nice as the shrubs I make with the Pineapple White Balsamic from Il Gusto or the Faversham Raspberry Vinegar from Mighty Fine Things (their sister brand has also just launched bottled Spiced Damson Shrubs and Raspberry Shrubs I want to try) so I browse both websites to figure out which will be the best value for money to order from. 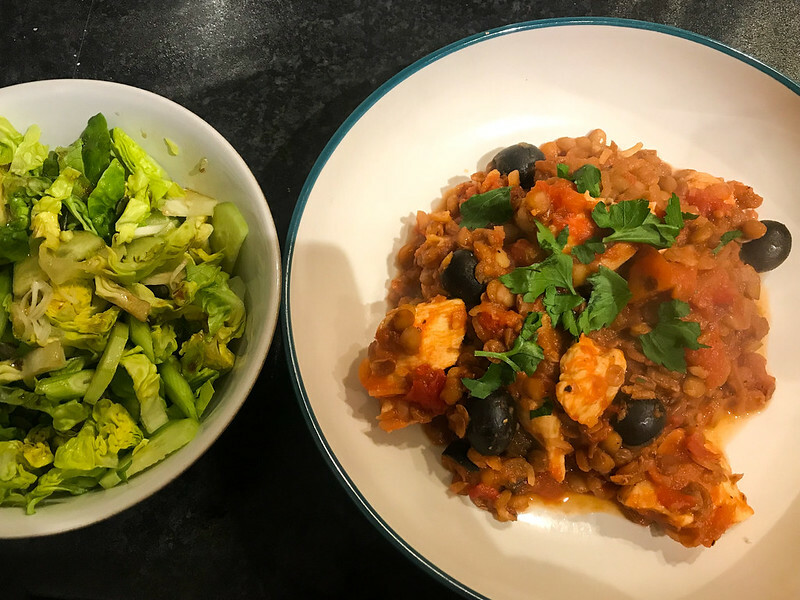 7:51pm – Dinner tonight is a chicken, lentil and tomato stew with black olives I pulled out of Waitrose Weekend a few months ago. Nothing to write home about, but perfectly tasty. I made J chips on the side (odd I know, but I was making him eat lentils so I happily took the request!) and I had a green salad with spring onions, cucumber, sunflower seeds and a quick dressing made from extra virgin olive oil and some more of that strawberry balsamic vinegar. 8:23pm – Two more Mon Cheri for dessert. Now you can see why I only have chocolate I’ve been given as a gift in the house, rather than buying myself any! 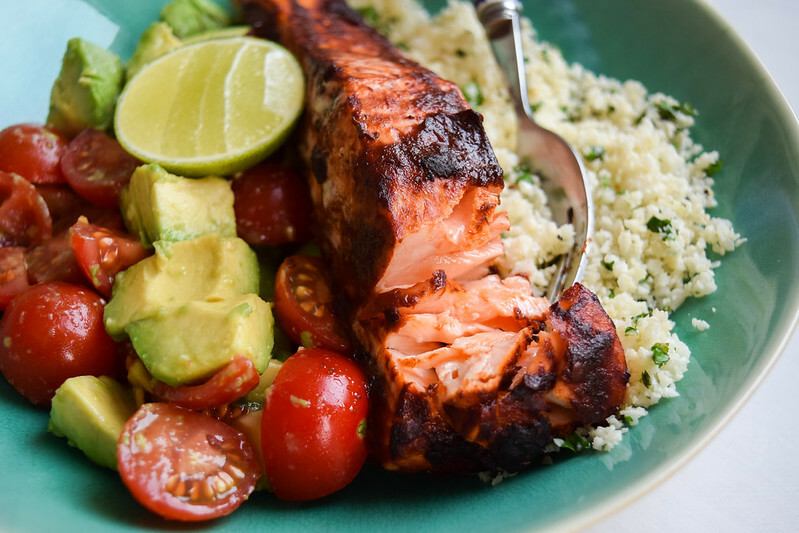 12:53pm – Cold (photographing again) chipotle salmon, Mexican cauliflower rice and a tomato and avocado salsa for Refinery 29. You can find the recipe here. 6:26pm – Small glass of red wine while I put together an Ocado order before dinner. I’m not going to keep track of what I’m drinking from now on, because I’m off to a house party after dinner, and that would just be rude. 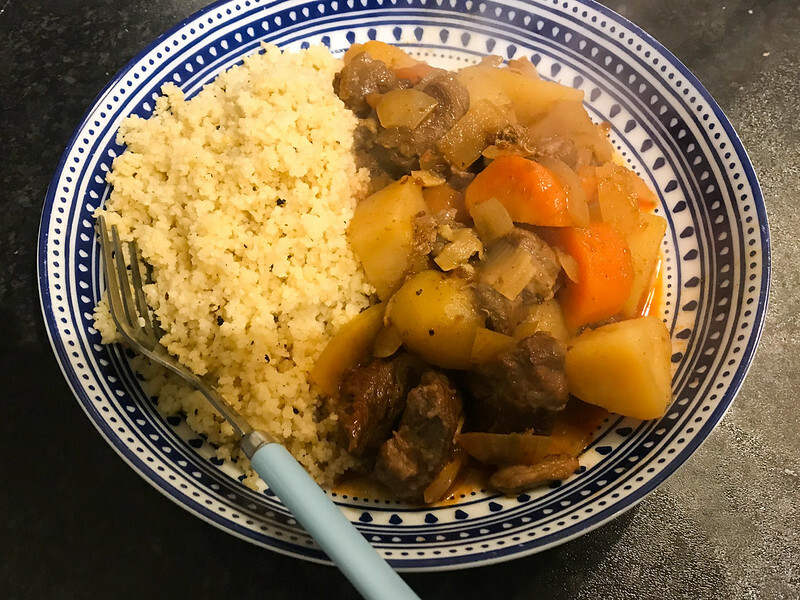 7:28pm – Some leftover spicy harissa beef stew and couscous with another glass of wine. 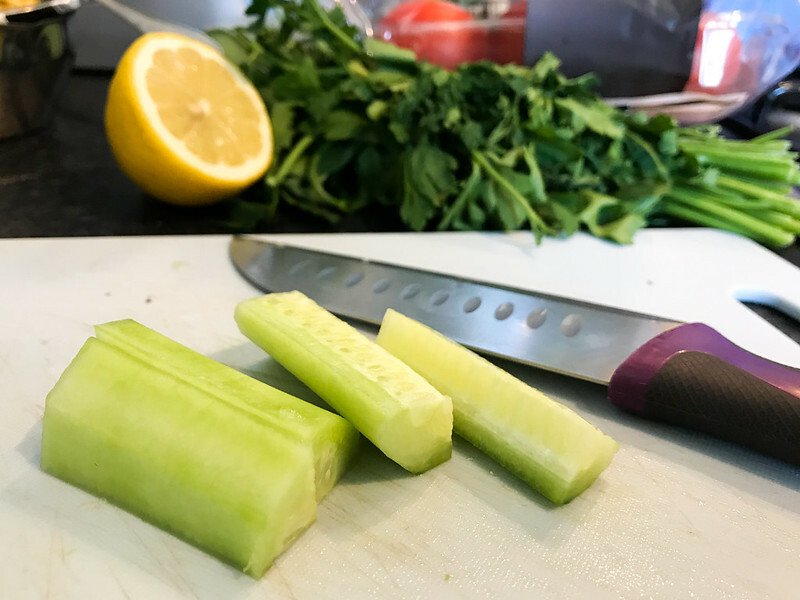 I love this recipe for the slow cooker – coming soon!